Bidong was once the most densely populated place on earth. Now, just three people remain. 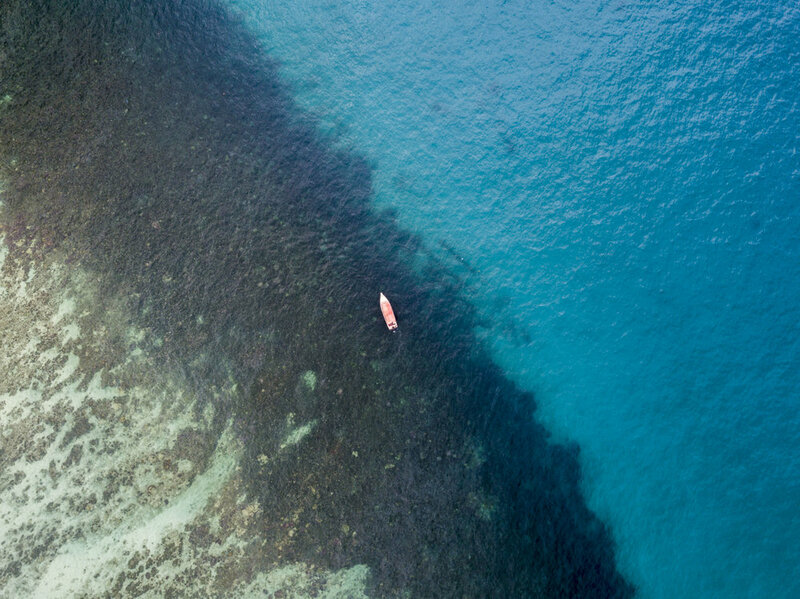 A small fishing boat drifts over Bidong's nearby coral. A few locations may come to mind when you think of the world's most densely populated places. Hong Kong is up there. Manhattan, perhaps. Male, the Maldives' island capital, or the fuvelas of Rio de Janeiro are contenders. Less would cite Pulau Bidong, a tiny island off Malaysia's north-east coast that, at least momentarily in 1979, laid claim to that title. 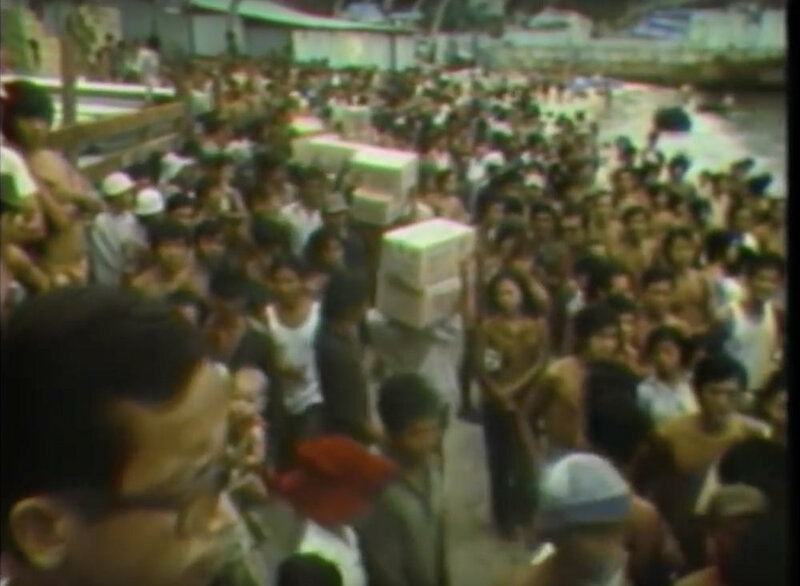 As the South Vietnamese began to lose the Vietnam war in the mid-1970s, hundreds of thousands of Vietnamese fled persecution, with the exodus only slowing in the early 1990s. By then, according to the New York Times, some 800,000 Vietnamese had fled the country. It was one of the largest mass migrations in modern history, and placed an enormous strain on neighbouring countries, who had to quickly respond to ceaseless tides of hungry, desperate people arriving on their shores. Nowhere was this phenomenon more acutely felt than in north-east Malaysia, where over a quarter of a million refugees arrived. 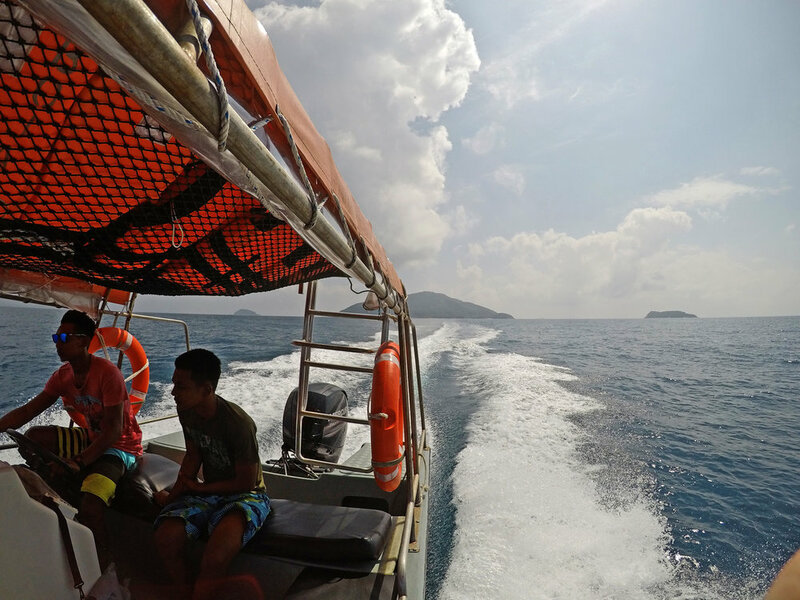 And most of those who made it to Malaysia were quickly relocated to Bidong Island, a small 1 square kilometer mountain jutting its peak out of the South China Sea. Some Vietnamese spent years on Bidong before being eventually resettled in third countries. By 1991, the last of the refugees left and the Malaysian authorities forbade access to the island, allowing mother nature to reclaim it, and all but destroy the evidence of its past. This incredible shot (photographer unknown) demonstrates just how many individuals at once called this island home. This taken in Bidong's main 'harbour', on the island's west. 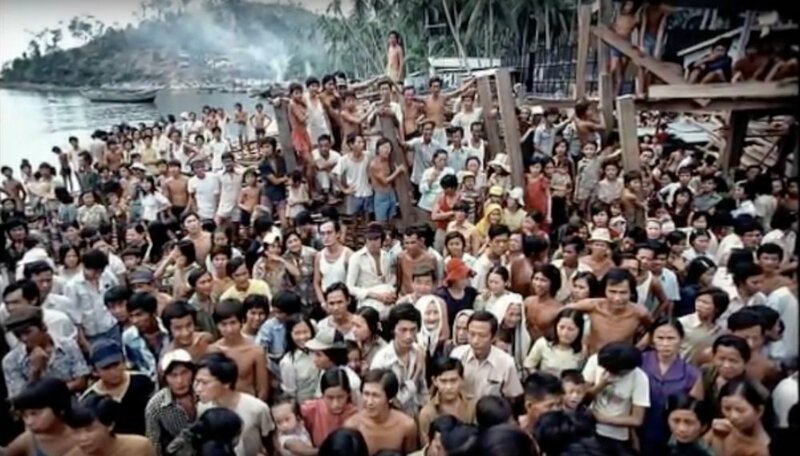 The island was thought to be the most densely populated place on earth in 1979, when it housed at least 40,000 people (though official signage at Bidong's jetty suggests the peak was over 60,000). Screenshots from the 1979 ABC News dispatch by Jim Laurie, above, contrast significantly with the same locations on the island today. Migrants arriving on full boats. The barren cliff faces today. Me and my guides departing. Having met people in Sydney who passed through this island as children, I was determined to see Bidong while in Malaysia, so I made my way to the peninsular's east coast. I departed the jetty of Merang, a small and quiet fishing village just 10 kilometers away from Bidong Island, early in the morning. I was surprised to have charted a boat with two teenagers at the helm. And even more surprised when one of them introduced themselves to me as Rafael, hardly the most common name on the east of the Malay peninsular. The boat ride was fast and bumpy. The waters were turquoise, but undulating, with the empty boat flying from sea to sea, landing heavily after each wave . After 30 minutes on the empty ocean, we arrived at Bidong jetty. My guides were somewhat confused as to why I was there. No one comes to the island anymore, save for a few Vietnamese who travel there to pay homage to their past. Some local fisherman plough the nearby waters, and some scientists working on coral preservation come occasionally. The lack of human presence is immediately felt. What were once were buildings are now just-surviving foundations overgrown with jungle. The endless graves the scatter the interior of the island suffer all the comes with inattention. Most graves are damaged. Some have, sadly, completely caved in on themselves. Dozens of memorials, too, pay tribite to the generosity of local people. While Malaysia was strained by the presence of so many refugees, locals in Merang - the closest settlement to Bidong - reflect proudly on the way their community responded to the influx. This otherwise sleepy, unknown town stood up when they needed to, providing food and water to the incoming arrivals. For those who survived the journey and made Bidong their home, an enormous sense of gratitude to the people of Malaysia is clear. After a hike through the jungle, exploring the endless graves and memorials, we continued around to the island's east, where we met the island's few inhabitants. Though the island's dead number in the thousands, its permanent living population is just three. Yep - three castaways camped just feet away from one of Bidong's only accessible beaches with only each other and their fish for company. The three marine biologists, my guides and I in the basic shared eating space. A needlefish swimming over recovering coral by Bidong's jetty. The marine biologists are working to revive coral species that were lost when populations hit their peak on Bidong and continue to be challenged by warming ocean waters. These young upstarts, employed by the Malaysian University of Terengganu, live a spartan life, sharing basic accommodation and spending their days tending to climate-controlled fish tanks which house a range of coral species, including, much to my guide's delight, schools of Nemos (more professionally known as clown fish). Their goal is to eventually re-integrate the species they are saving into the natural environment just feet away. No one really knows what to do with Bidong in the long term. Tourism is touted by some as one option. 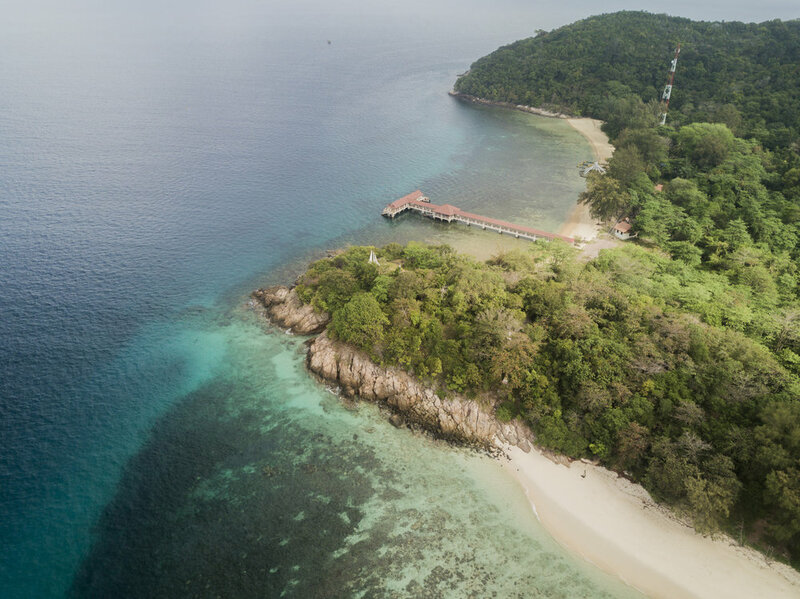 But Bidong's dark, powerful history, its lack of accessible beaches and the small number of travellers who come to its side of Malaysia make such an investment highly unlikely. Its awkward distance from the mainland also makes it hard to justify converting the island into a museum displaying its history, as some have suggested. But there is some hope that the recovering coral reef surrounding the island could one day bring ecotourists, divers and scientists. For now, though, Bidong remains largely abandoned, defined by its past, and uncertain of its future. Staring awkwardly into the sun on Bidong's jetty. Note: Stay tuned for more stories and photos from this island I'll be releasing as part of a larger project later in 2018. Crossing the Malaysia-Thailand border: is it safe? Photoessay: 48 hours in Melaka, Malaysia.